The University of Sri Jayewardenepura is set to celebrate 60 years of shouldering the progress of the nation through education excellence with a grand innovation and invention exhibition titled ‘INNOVATE SRI LANKA 2019’. This one-of-a-kind exhibition is the largest and the first by a local university to promote innovations within the university and outside. INNOVATE SRI LANKA 2019 is set to be inaugurated by President Maithripala Sirisena and Dr. Bandula Wijay on April 2 at the Sirimavo Bandaranaike exhibition premises at the BMICH and will be open for public, school and university students, innovators, investors and industry experts on 2nd & 3rd April from 8.30 AM till 9.00 PM. One of the oldest and most renowned tertiary education institutes in the country, University of Sri Jayewardenepura has immensely contributed to the fields of Medical Science, Applied Sciences, Commerce and Management and Arts. Since the addition of Engineering and Technology faculties to the university in 2016, the University’s focus has been shifted to driving innovations and inventions, thus fulfilling a huge vacuum in the education system of the country. 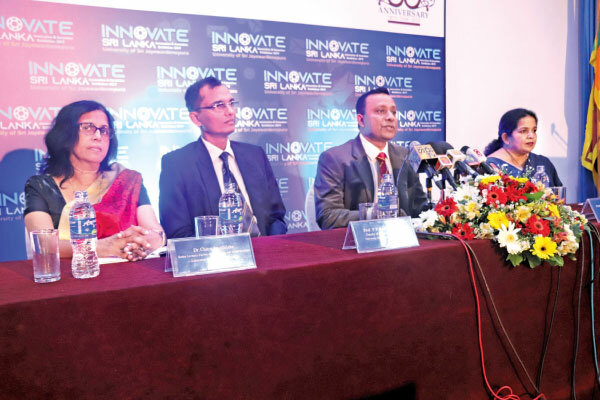 ‘INNOVATE SRI LANKA 2019’ is the culmination of the University Administration and the Innovation and Venture Creation Council’s endeavors over the last few years following this policy decision to promote innovations. The exhibition has created a platform for the 15 research centers that operate within the university and 26 business start-ups initiated by the students of the university. A number of prominent entrepreneurs who are the products of Sri Jayewardenepura University will also be featured and recognized at the exhibition for their great contribution to the nation. The two day exhibition will also feature a number of other interesting segments including a medical camp by the university’s medical faculty and launch of 7 books in commemoration of the university’s 60th anniversary.